From April 9 through April 17, following months of intensive planning, CJP’s Boston-Haifa Connection hosted a team of IDF officers for the first-ever Hatikva Mission, timed to coincide with the emotional period between Yom HaShoah and Israel’s observance of its Memorial and Independence Days. The select group of officers met with thousands of members of the Boston Jewish community in schools, synagogues, and homes; represented the IDF, in uniform, at Faneuil Hall for Boston’s observance of Holocaust Remembrance Day on April 11; and met Massachusetts state representatives at the State House a day before flying home, just in time to recall fallen comrades, friends and relatives on Yom HaZikaron. Below is the first installment of a four-part look-back on this mission, written by Ken Kaplan. On a drizzly Friday afternoon, two dozen people crowded the shabby kitchen of a youth hostel in Boston’s Fenway neighborhood. A seemingly random assortment of faded posters was all that adorned the peeling walls. A single ceiling fan struggled to circulate the increasingly warm and humid air. The yellowed window panes gave a view only of grimy brick walls and fire escapes. Yet a sense of urgency was palpable in the room, an unlikely venue for the last strategy session of a Zionist mission that would moisten eyes, constrict throats, and open minds in dozens of poignant encounters with thousands of Boston-area residents and community leaders, Jews and non-Jews. 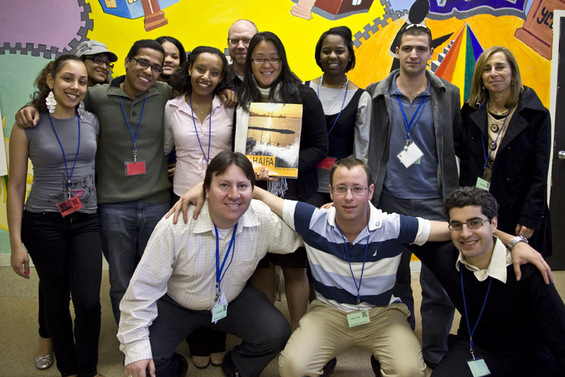 Among the mission’s many lofty goals: strengthen the unity of the Jewish people, put a human face on Israel’s uniformed defenders, inculcate among American Jewish youth a stronger identification with Israel and Israelis and strengthen their Jewish identity, and groom a generation of future leaders. At the center of the kitchen, wedged around two narrow tables, were 12 officers from various branches of the Israel Defense Forces – the Navy, Intelligence, and Artillery Corps among them. The 12, looking bright eyed and fresh despite nearly 20 hours of travel, focused their gazes on a succession of impassioned speakers who minced few words in outlining the many challenges the officers would face in their 9 days in Boston. The officers, all Haifa natives, had used personal vacation time to make the trip, a long-planned project of CJP’s Boston-Haifa Connection (BHC). They knew they were engaging in a Zionist enterprise, something more than just a week of overseas travel away from their military duties. They knew they were coming to share and to teach. What ultimately surprised all of them was how much they learned, as well, and how what they learned reinforced their own sense of dedication as Israeli officers. And perhaps even more important, at a time when Israelis’ sense of isolation in the world has been heightened and their confidence shaken, the officers were given a renewed sense that they have the support and affection of Diaspora Jews, as a community and as individuals. A bundle of barely contained, wiry energy in the kitchen that day was Debbie Kurinsky, a veteran of several CJP campaigns and Boston co-chair of the Hatikva Mission, who had spent months contacting individuals and organizations in the Boston Jewish community to arrange the officers’ busy schedule. A 9-year supporter of the Boston-Haifa Connection and in her 5th year as a member of CJP’s Israel and Overseas Committee, Kurinsky, an attorney, later reflected on the mission’s many ambitious goals. Kurinsky said the planners also anticipated, correctly, that the mission would have a profound impact on the soldiers themselves, creating an opportunity for a deeper exploration of their own Jewish identity. The whole trip, she said, was very much in line with CJP’s latest strategic plan, part of which seeks to create stronger ties with Israel and to build the next generation of leadership. Kurinsky said some of the goals were first articulated in a letter last July from Haifa co-chair Danny Nishlis, who owns and manages Radio Haifa. As the mission later was winding down with a debriefing at the CJP, Nishlis expressed delight at the “bonus” value the officers were bringing home. “I also think the ties that were formed with students, with pupils in schools, with members of synagogue communities, helps strengthen the connection. But I was also surprised to see the changes among the officers, changes in their perception of the Jewish community in America, a changed perception in the love for Israel, giving to Israel, membership in the Jewish community, in Jewish organizations, volunteering, the connection to Haifa. Another key volunteer from Haifa was Yoav “Yabee” Keren, a former lieutenant-colonel in the Israeli army reserves and the former head of Scouts in Haifa who was the officers’ father, mother, and constant companion during the mission. It was his job to worry about everything, and throughout the visit he sought, at times nervously, to shelter the officers from any whiff of protests or controversy. But by the end of the week his excitement at the mission’s successes was bubbling over.